For my last Chinese venture at the moment, it had to be the China League 2. Simply as this was the only league with matches in mid-week. 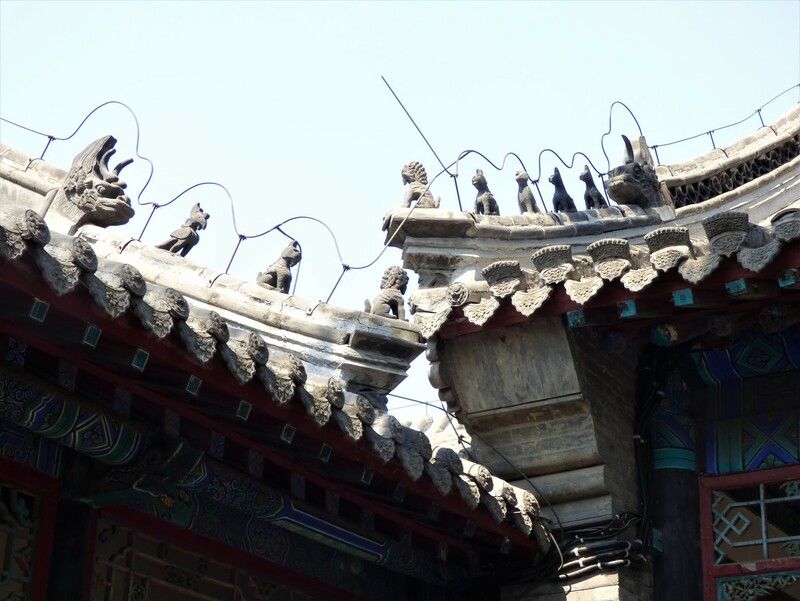 China is a vast country, so there are very few journeys that can be comfortably done, there and back again in the same day – but Baoding, around 150 km from Beijing fitted the bill well. 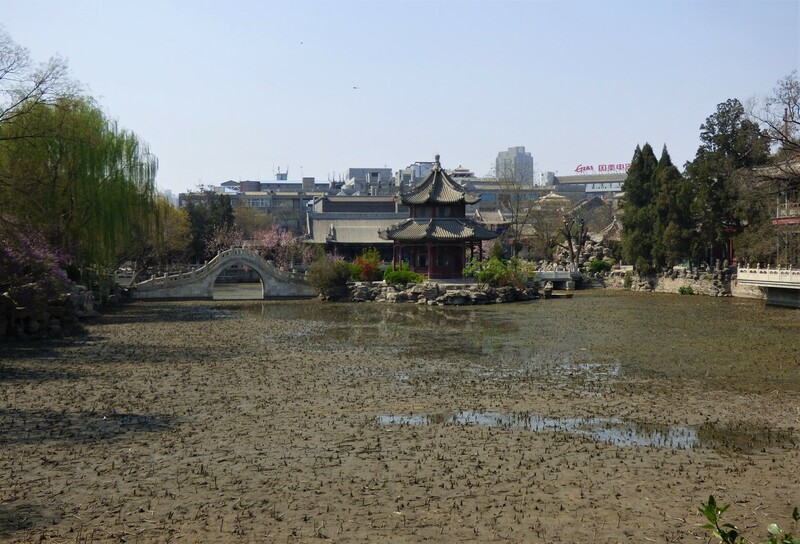 Baoding, a former provincial capital is not a city everyone has heard of. 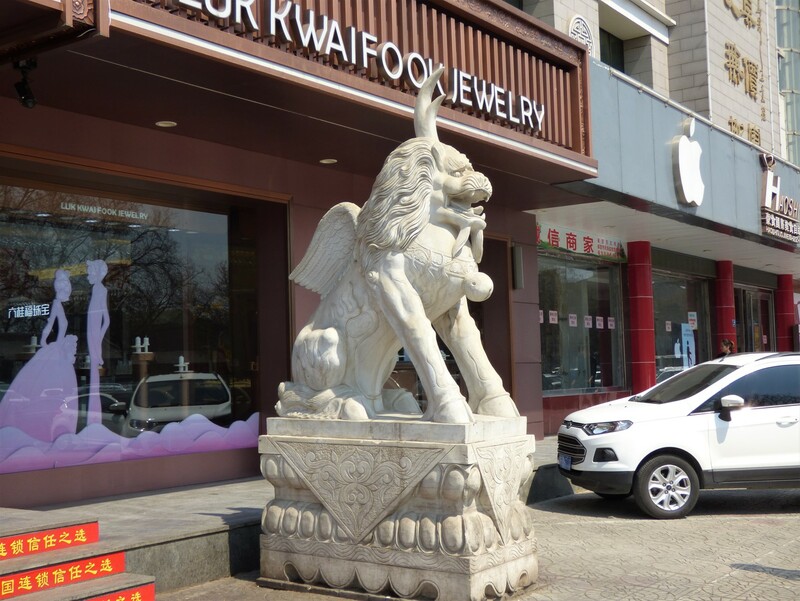 But actually, including its extensive suburbs it comes in as large by Chinese standards, with a population a little larger than Greater London. 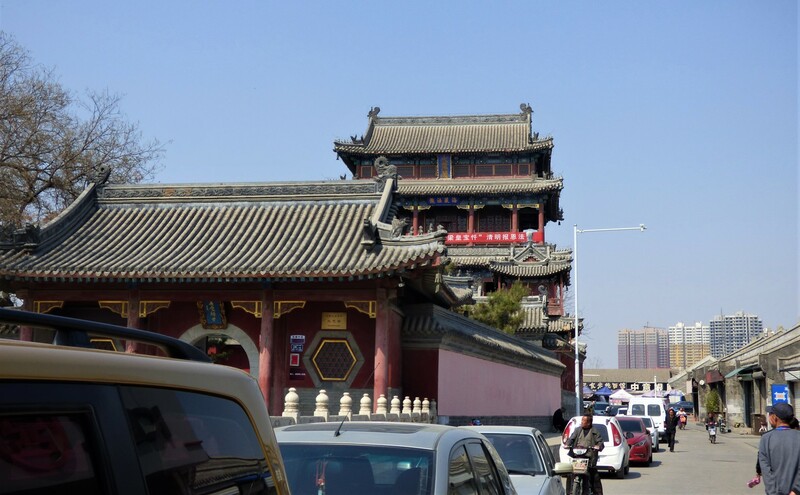 From the Daci Pavilion, I took a taxi to the Hebei University Stadium. I had it in mind that it would be just about within walking distance as the main university buildings appeared to be a 20-30-minute walk. The problem being I had not identified the football ground itself on maps of the area. It turned out I needed the taxi as it was around 7 km to the stadium, which is right out on the third ring road. Next up was the problem I had not expected to encounter. Tickets were 20 Yuan (about £2.20), and I had a 100 Yuan note ready to offer – having just paid my only 20 Yuan note to the taxi driver. Sorry, they cannot take that. China is fast becoming a cashless society and almost everyone pays for almost everything using their mobile phone. However, this is only available with a Chinese bank account. Apparently, I was the first person to try and pay cash, and the people in the office were going to do nothing to help. Fortunately, one of the other purchasers did find the change and I got my ticket. Once inside, and before heading for the seat I looked, as I do for a way in to pick up the team list. A person who I can best describe as a club “unofficial” asked me what I was looking for. The person, to which great thanks for my day out should go, was Huang Wei. He described himself as a soldier, but showed me a picture of him sitting on the mower and acting as a groundsman the day before the game. After a quick call, he walked me past the security guards and into the VIP areas. We entered an office where I was given (free) a second ticket. This was for the VIP area. One of the officials then disappeared for a minute and came back with the team list. All in Chinese, of course – but enough that I could compare with the lists and Wikipedia later and make sure the names I had were accurate. The stadium has a running track and two near identical stands. Each of these is in two tiers with a slight overlap between them. This overhang is the only cover provided as while part of the structure for a roof has been started, there is no sign that the roofs will be completed at any time soon. Both ends of the stadium were closed with no spectator accommodation and portraits of the squad filing up the wall space. No one sat in the upper tiers and a giant banner filled a space opposite where we were sitting. I was now in the very comfortable VIP seats in the centre. To each side of me were supporters’ groups who would sing, wave flags and bang drums through the game. Huang explained that playing during the afternoon in the middle of the week meant the crowd was very small. I tried to ask why they did not play in the evening instead but I did not get an answer to this one. 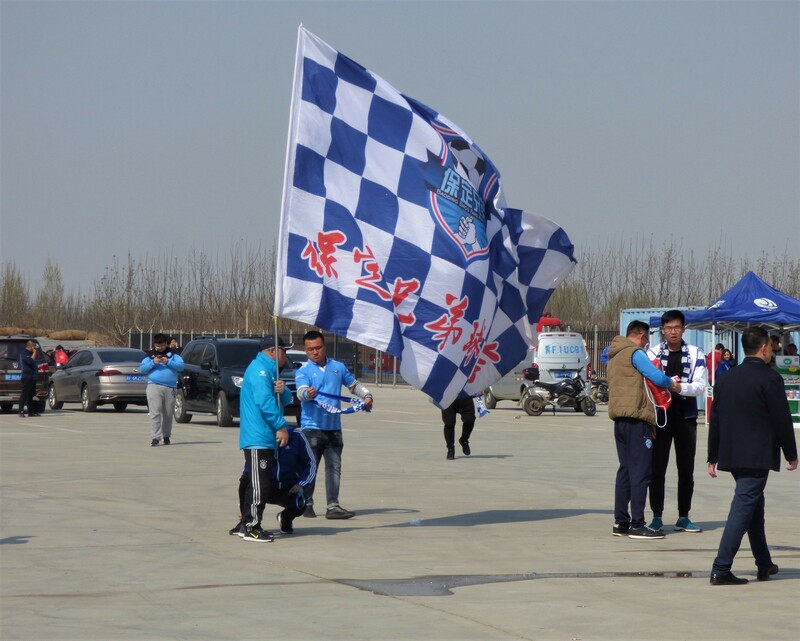 I mentioned it to Brandon, who reports for Wild East Football, an English Language discussion of Chinese Football, (albeit mainly focussed on the Super League and the National team). He thought the reason may well be that the cost of turning the lights on would exceed the extra income by playing later. My own theory is that with the fixture list stating matches where to be played at 15.00, no one at the clubs actually take the time to think whether it can be changed. I noticed later that out of eight games, one had been changed to an evening kick off, so possibly the people at Zibo took time to think. I know the change was announced less than a week before the games. Having been issued with a paid ticket outside, and a free one inside, I was probably counted twice on the official figure anyway. 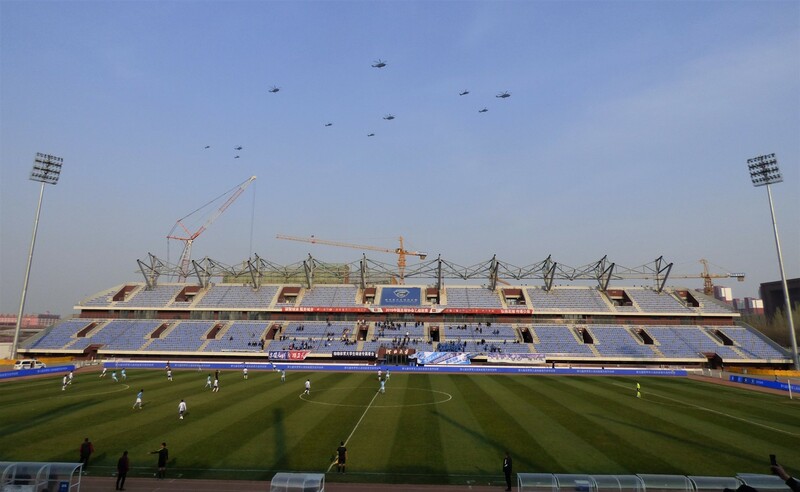 Noticing before the game that the visitors, Dalian Chanjoy had no less than five players in their squad on loan from Dalian’s Super League team, I had expected a youthful squad running at least to some extent as a development team for the city’s more senior side. The truth was a lot different. The two loan players in the starting XI were both 30 years old, and the average age of the visiting team at the start was 29. The home side was barely less experienced. Both sides did manage to have two U-21 outfield players on the bench – more of them later. In Dalian’s case, these were also loanees. The fifth was not in the squad on the day at all. Despite Huang making excuses for the game, pointing out that China League 2 is a long way from the Super League, it was in fact an entertaining game with plenty of chances created at both ends. Unfortunately, most of them ended up with players unable to convert in the area. Baoding had a brief spell when they looked very strong at the start after which the visitors appeared to take control. 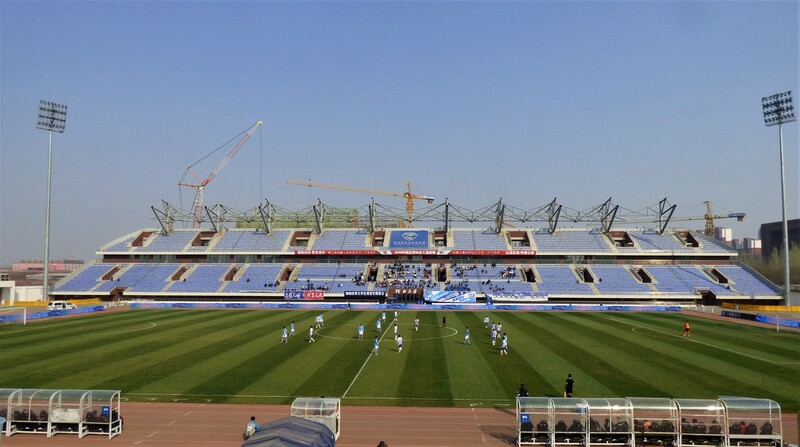 Knowing that Dalian had scored ten goals in their first two league matches, their inability to land a strike on target from so many opportunities was disappointing. 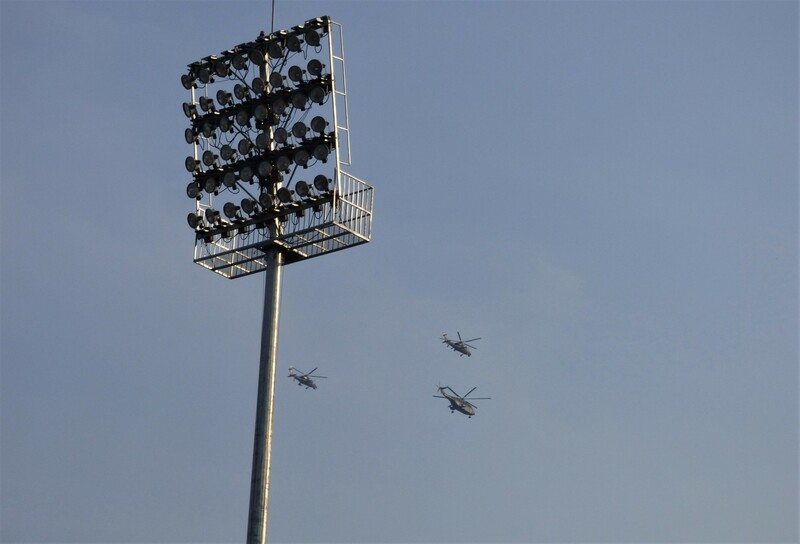 At the start and end, we were treated (I think coincidentally) by a series of formation helicopter flypasts. With the distances involved, the league is a fully professional league, but the money is not a great deal and many clubs have trouble with their finances. 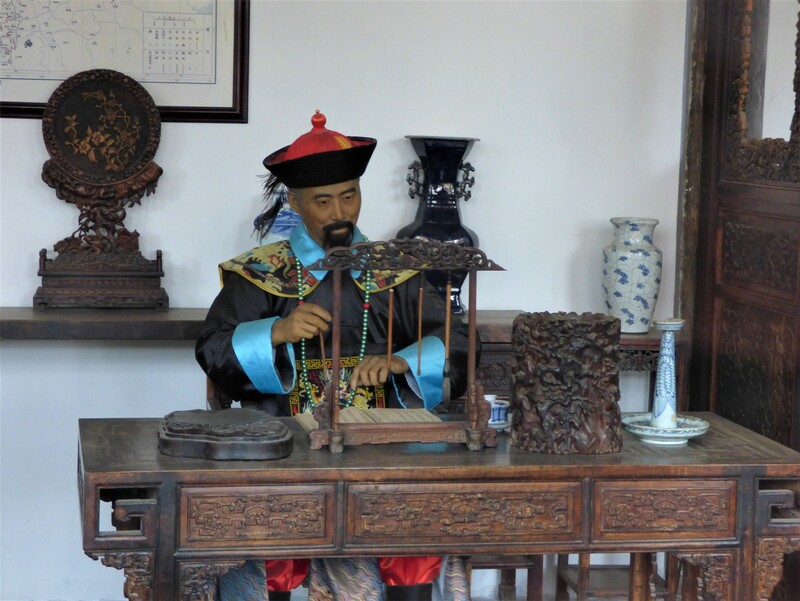 Baoding were one of several clubs I researched and found news stories about unpaid wages and similar difficulties. They had a single season in League-1, the next level up and midway through that the chairman had what can only be described as a “hissy fit”, threatening to pull out due to the impossibility of competing. Probably under pressure from local politicians, he apologised for this soon afterwards, but the club’s owners, Rongda pulled out during the close season. 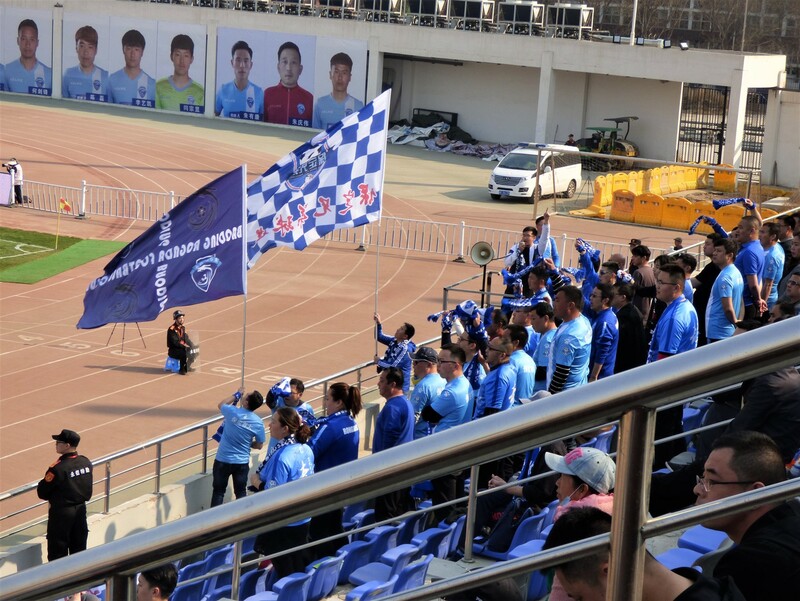 This apparently puts them into local authority control and should have removed Rongda from the name of the club – but all the badging stayed with the old owners and the support were chanting the name Rongda during the game. As was pointed out to me later, it is very likely that many of these are Rongda employees and have been given leave to attend the match by the company which remains a sponsor. 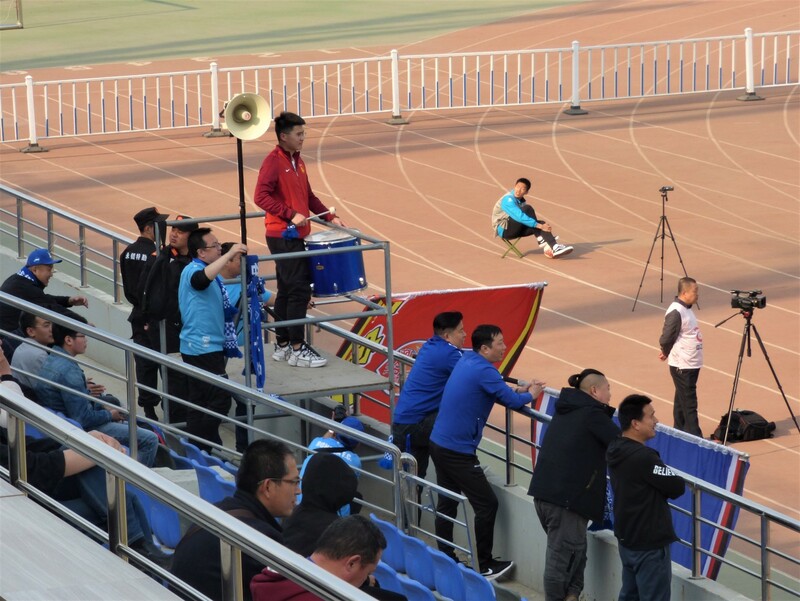 With such a low income from the spectators, no TV deals at this level and very little marketing, all clubs at this level (and in fact at every level in Chinese football) rely on the owners and other sponsors to finance them. However, if the municipality believes that the football club is something to be supported, then political pressure is applied to the larger successful businesses in the area. For many clubs, it is still a hand to mouth existence, especially in the lower levels. A fourth level looks like being more organised this season, under the curious title f the Champions League. This made more sense in the past, when this was a competition where provincial and city champions would vie for places in League-2, but makes less sense with four regional divisions of 16 teams each. I have yet to see the make up of the league, but some of the journeys involved will be a lot further than Lands End to John O’Groats and as such one wonders how accurate the description of this as an amateur league will be. And for that matter, how many of the 64 teams do not complete the season or drop out at the end. 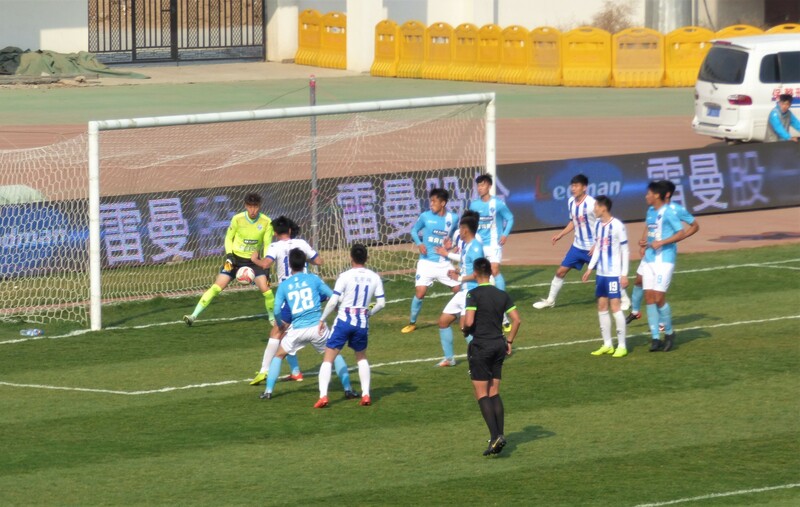 Looking back on my match, Dalian broke the deadlock with a looping header just under 15 minutes from the end. They then made a tactical decision to try and shut up shop, switching from 4-4-2 to 4-5-1. Knowing they had scored a lot of goals in their earlier matches, this was disappointing, but it was true that Baoding did have a team that could mount a threat. Both teams had made one substitution before the goal, but the playing of the other subs are restrained by rules, and not by the needs of the team. I was aware of the Super League rules on U-23 players, one must start and two more must appear on the field, subject to some exceptions allowed if players are called up to the National squads many training sessions. Neither team had an U-23 player at the start, so it appeared there was no rule concerning the starting squad at this level, but the team lists both noted the U-21 players on the bench for each side. Baoding had two such players and they entered the field on 80 and 84 minutes. 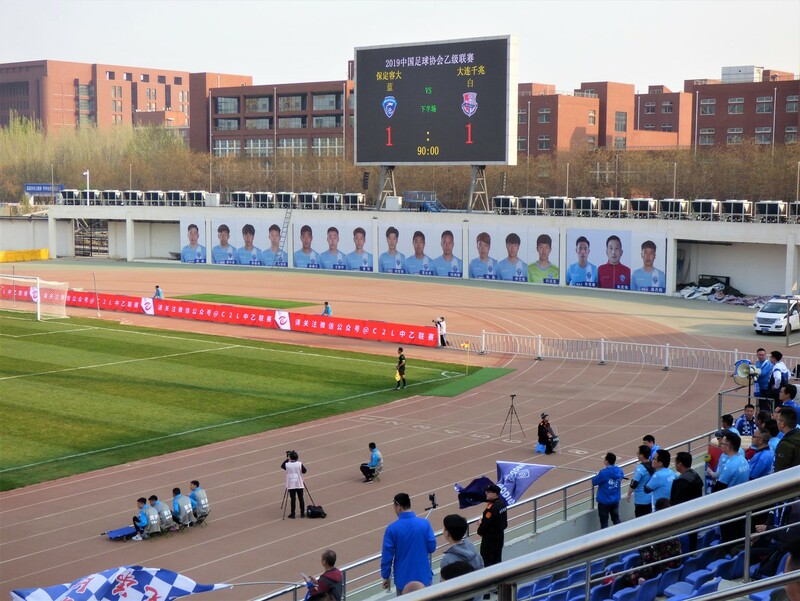 Dalian, by comparison reached the 90th minute without playing a substitution, but had both their U-21 players ready to come on in the final minute. With a player down injured, we were allowed the fairly unique sight where the first of these players came on, and then a few seconds later and without play restarting the second U-21 player replaced the first one. Hence a substitute was on the field for around 20 seconds in which the ball was not in play. A minute late, a near post header from Li Lingwei was forced in for an equaliser, giving the home team an unexpected point. I asked Huang Wei if he could order me a taxi to get to the station, but he went one better and took me there himself, even helping me through the chaotic ticket purchasing process. (It is quite straight forward, but getting to the front of the queue takes time and there is always someone coming to the window from the side trying to argue some point with the ticket clerk). My evening finished with a couple of beers at the Great Leap brewery, one of Beijing’s best beer outlets. You are currently browsing the Football Shaped blog archives for April, 2019.